Metal detecting has produced some fantastic finds recently. The Staffordshire and Frome Hoards have excited the historian in all of us, but Alice Roberts asks at what cost. The Staffordshire and Frome Hoards are just two of the most exciting archaeological finds in recent years. Both were found by amateur treasure hunters in the UK using metal detectors. A good news story in these tough times but what is the real affect of legions of unqualified diggers on Britain's heritage and landscape? 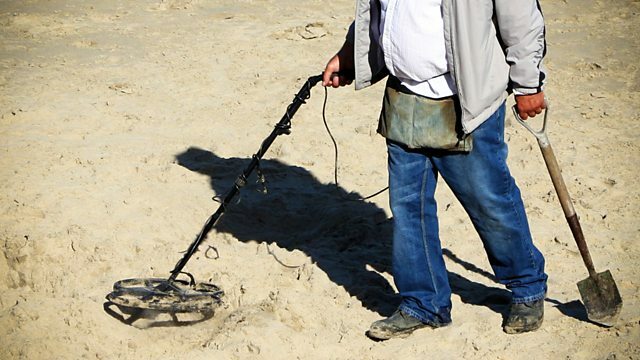 The growing popularity of metal detectors has meant big finds in the past few years but a new detector has been produced which triples the depth at which small objects can be detected. So far detecting has been tolerated in Britain on the basis that it only digs up land to plough depth and therefore doesn't exacerbate disturbance of historically significant sites. This new development adds fuel to what is already a heated debate. Archaeologists feel that treasure hunters take valuable finds from sites which should be excavated properly, archaeology is all about context they argue and once artefacts are removed our heritage is lost. The Countryside Alliance is warning landowners not to allow metal detectors on their land in order to avoid disputes but many detectors have signed up to a voluntary code designed to minimise their impact on farmland. The detectors argues that without their valuable help today's agrochemicals will destroy a base metal object within a few years of it being in the ground. Coins have been destroyed in the last 50 years which have been in the ground for millennia. Stone implements are also broken with today's modern mechanical ploughs. There are 30,000 metal detectorists today. They started detecting landmines after the war but will they continue to offer a service to the landscape and its heritage or simply take what it has to offer.